The Surrey Eagles moved into a tie for first place in the BCHL with a 6-2 victory over the Cowichan Valley Capitals at the South Surrey Arena on Sunday afternoon. Adam Tambellini scored twice while Michael Stenerson chipped in with three points in the win. The Capitals opened the scoring in the opening frame after an errant pass by Craig Wyszomirski was intercepted by Dane Gibson who skated in on goal and was stopped by Michael Santaguida, but the rebound came right to Garrett Skrbich who tucked the puck into the cage to give the visitors the lead. Michael Stenerson equalized for Surrey at 12:01 of the first when Dan O'Keefe's point shot was deflected by both Devon Toews and then Stenerson on its way to the goal. Surrey went ahead just before the midway mark of the second when Tyler Mueller turned the puck over at the Surrey blue line, sending Tambellini and Nic Pierog in on a 2-on-1. Tambellini elected to shoot, beating Cowichan goalie Patrick Spano cleanly. Jordan Klimek added to the lead before the end of the period when he rippled the mesh with a slap shot from the left point through traffic for his sixth goal of the season. Tambellini added his second goal of the night on the power play less than a minute into the final stanza, picking up a rebound off the end boards and scoring on the back hand. Joel Gaudet put his name on the score sheet as well after he tipped a Klimek point shot past Spano to make it 5-1. The Capitals got one back shortly thereafter when Ryan Coghlan picked up his own rebound and beat Santaguida to pull Cowichan to within three goals. The Eagles thought they had added to the lead when Drew Best found the back of the net, but the goal was disallowed because the net had come off its moorings. Brady Shaw scored Surrey's final goal of the night at 7:07 of the third, improving his team leading goal total to 37. 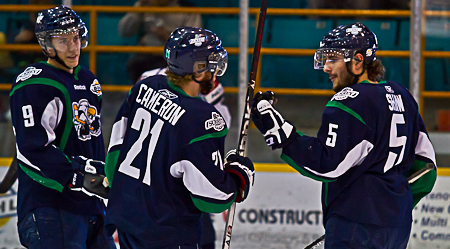 Surrey was 1-for-3 with the man advantage while Cowichan Valley went 0-for-4. The Eagles finished ahead on the shot clock 36-29. Surrey wins the season series against the Capitals after taking both match-ups. The Birds also learned that their first round opponent will be the Langley Rivermen after they clinched the fourth and final playoff spot in the Mainland Division. Surrey will return to action on Friday evening in Coquitlam against the Express.